disappointed that the club would treat a loyal young fan so appallingly. Thankfully I was able to go to the West Herts to calm down. Our usual pre-match crew was joined a couple of very welcome guests, who I hope will join us more regularly in the future. Team news was that Gracia had named the same team as last week, so the starting line-up was Karnezis; Janmaat, Mariappa, Prödl, Holebas; Doucouré, Capoue; Femenía, Hughes, Pereyra; Deeney. The Burnley team included former Watford loanee, Jack Cork, and their Management team, of course, includes Sean Dyche and Ian Woan. 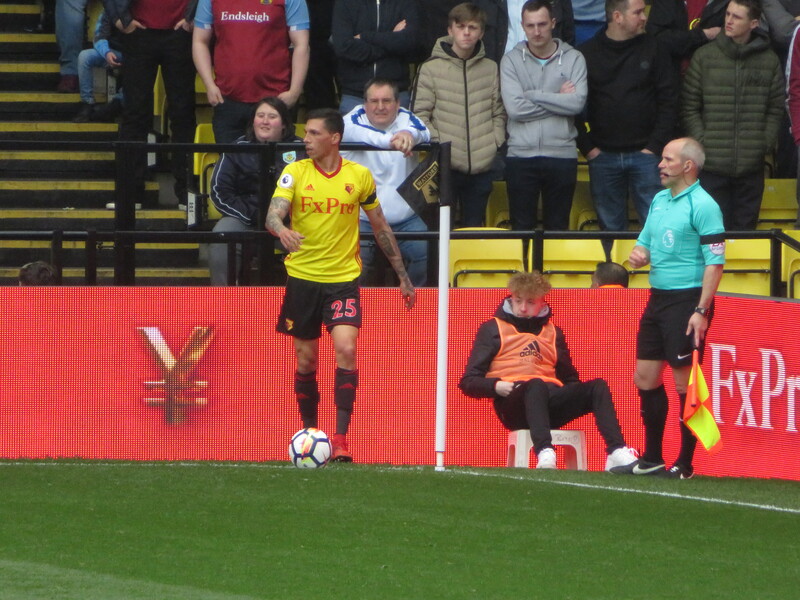 Tim Coombs made a point of welcoming Sean back after the teams were announced and the Burnley manager was given a terrific welcome by the Vicarage Road faithful. 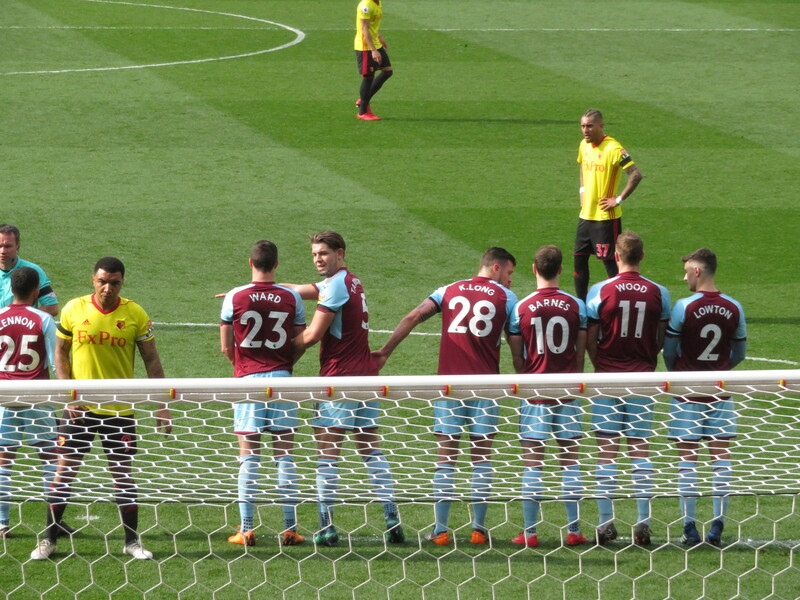 Burnley started the game very brightly and had the ball in the net in the second minute from a Wood header, but the goal was disallowed for offside. The visitors threatened again as a cross from Ward was met with a header from Barnes that cleared the crossbar. Watford’s first chance came from a Janmaat cross that Deeney glanced just wide of the far post. 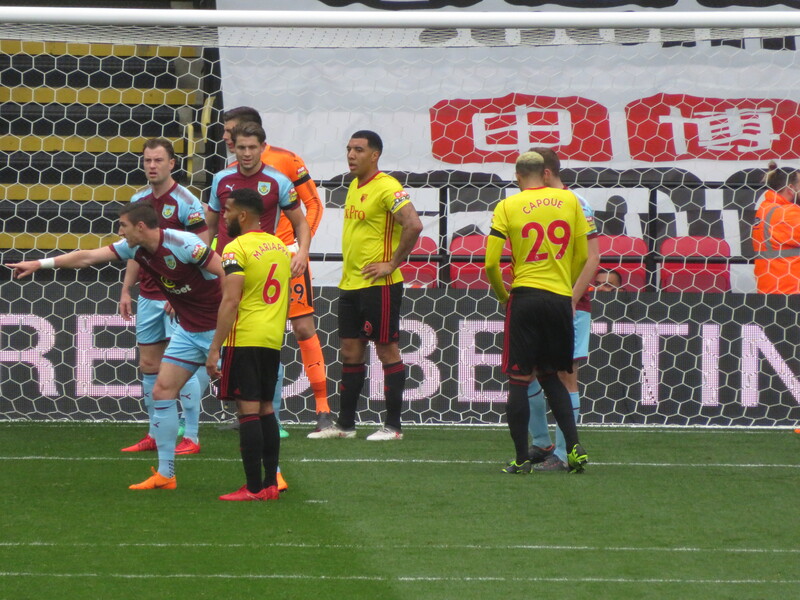 The next chance for the Hornets came from a lovely move involving Capoue, Janmaat and Hughes, who found Pereyra whose shot needed a decent save from the Burnley keeper, Pope, to keep it out. Pereyra had another chance soon after as a short corner was played to Holebas who crossed for the Argentinian, whose shot from distance was saved. The home side executed another lovely move as Hughes played a gorgeous pass to Femenía, who tried to return the compliment, but Pope was out to gather before the pass reached the Watford man. 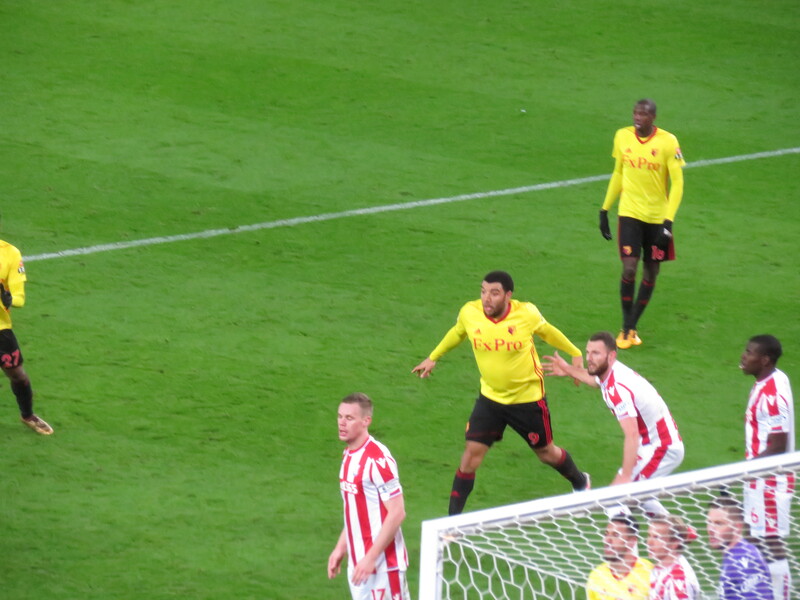 A rare attacking move for the visitors led to the ball pin-balling around the Watford box before it fell to Westwood whose shot was blocked by Mariappa. Another short corner for the home side allowed Holebas to put in a dangerous looking cross, but Pope was able to claim it. 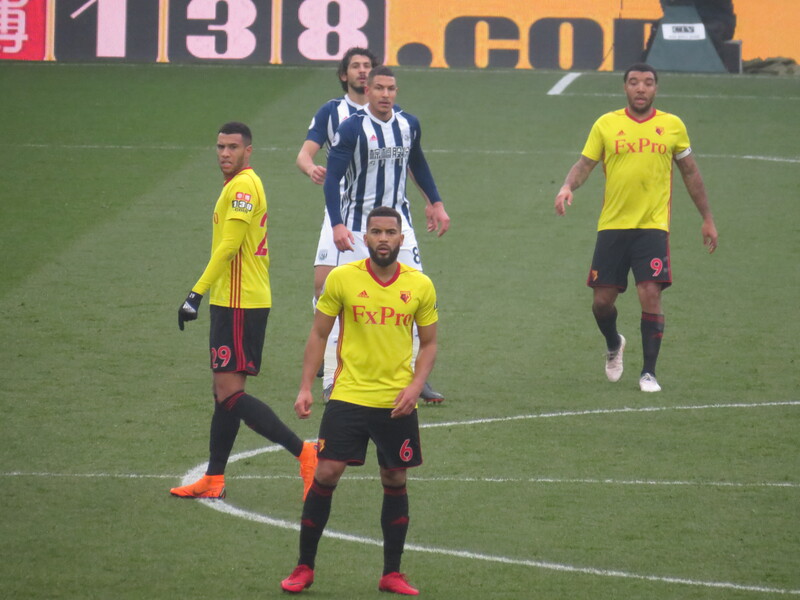 Watford attacked again, and the ball bounced between players without any of them being able to make a decent contact, finally it fell to Capoue who shot wide of the far post, to groans from the Rookery. Pereyra had another great chance to put the Hornets in the lead as he beat a defender to get into the box and shot towards the top corner, but Pope pulled off another great save to deny him. 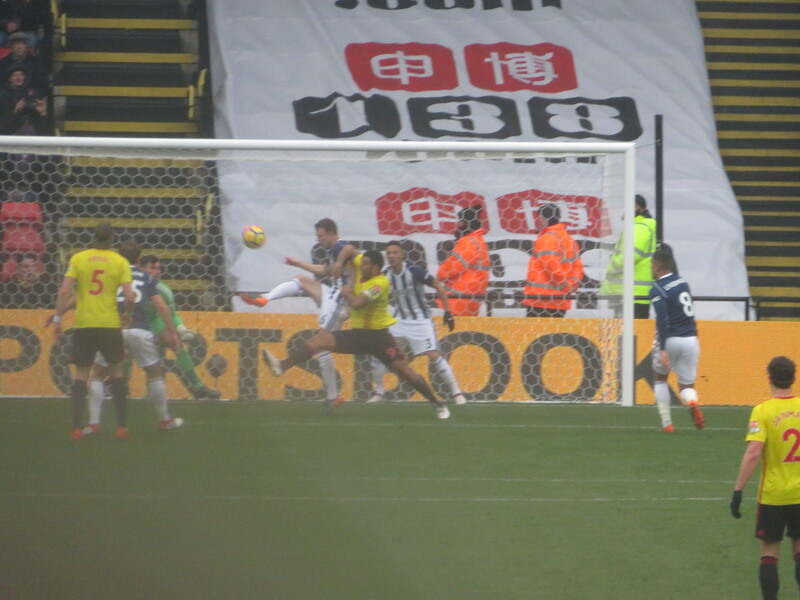 Deeney was the next to try his luck with a low shot that was cleared and that was it for the first half action. It had been a terrific half of football. The visitors started strongly but, from the 10th minute onwards, Watford were in control, playing some superb football and, were it not for a terrific performance from Pope in the Burnley goal, would have been a couple of goals to the good. 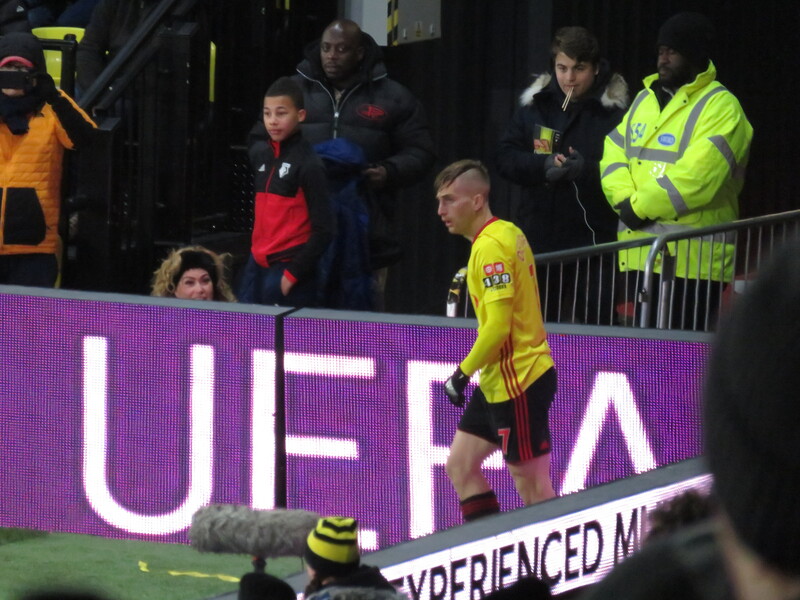 At half time, the crowd was introduced to Ryan Cassidy, a first year scholar who has just signed his first professional contract with Watford. The little I have seen of him in action for the U18/U23 has been impressive. Let us hope that he goes on to make a name for himself in the first team. The 50-50 draw was made by Malky Mackay, who mentioned that he had been joined by Aidy Boothroyd at the game. Malky was given a very warm welcome, which made me happy as I sponsored him for a few years as player/manager and always found him to be a lovely man. There was an early scare for the Hornets in the second half, as Karnezis came to gather a high ball and failed, thankfully it rebounded to safety. 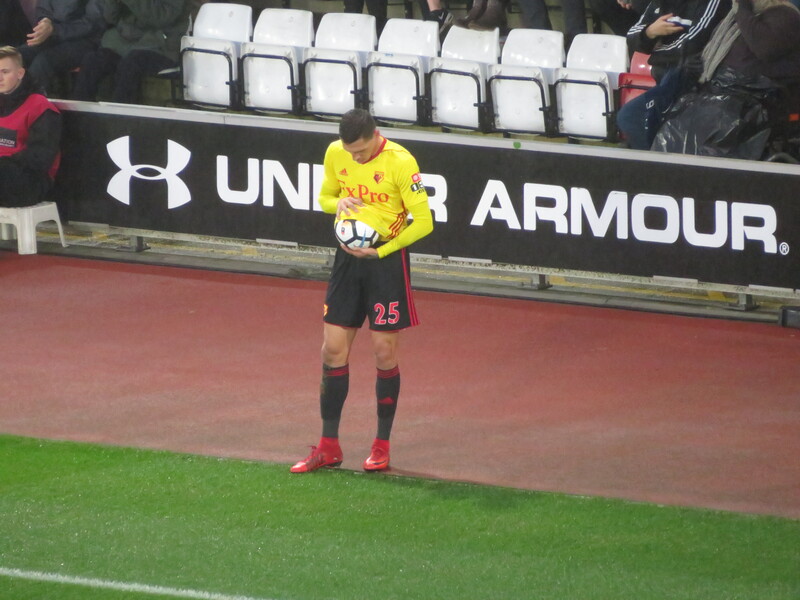 Watford’s first chance of the second period came as Femenía found Hughes who played the ball back to Janmaat whose shot was straight at the keeper. 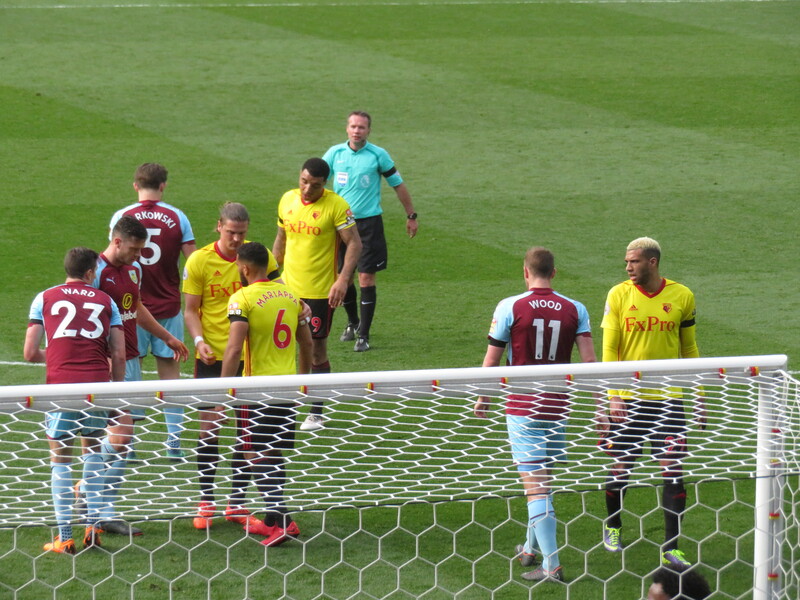 Watford won a free kick as Hughes was tripped on the edge of the Burnley box. 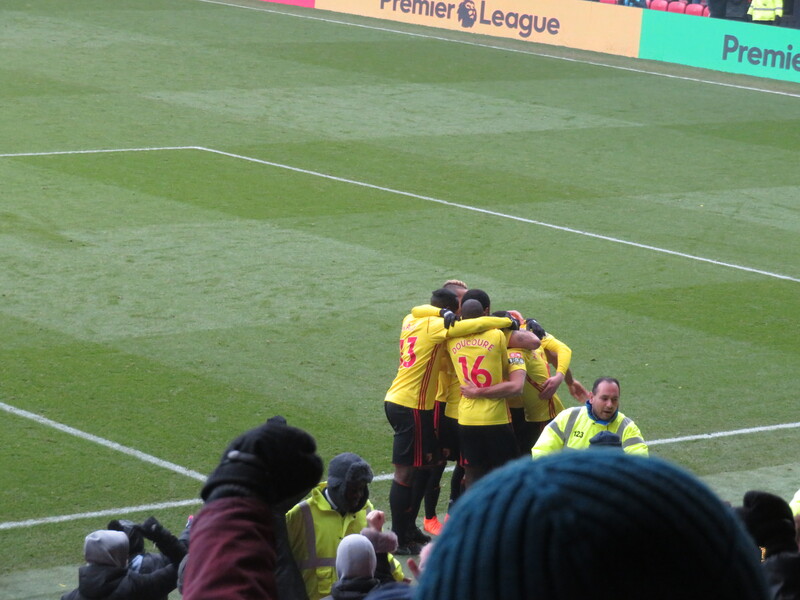 Pereyra’s set piece rebounded off the wall, but Watford kept possession and the ball reached Pereyra in the box, his strike was more impressive than last week’s, and had the same impact as it also ended up in the net to give Watford a very deserved lead. At that point, I thought we would go on and win the game. It wasn’t to be. There were a lot of complaints from those around us on the way up Occupation Road and it was very hard to come to terms with the fact that we had lost a game that we had dominated so convincingly. But, once Burnley equalized, we lost our nerve against a very well-organized team, so the game finished very badly for the Hornets. It is a source of some frustration that we have finished two very winnable games with only a point to show for a couple of excellent performances. There have been some very promising signs, Hughes and Pereyra have been outstanding, but we are not clinical enough in front of goal and make too many mistakes at the back. But the football has been (mostly entertaining), we must be safe and we have a terrific squad to build on for next year. These are still the good old days. This entry was posted in Watford FC and tagged Aaron Lennon, Abdoulaye Doucoure, Adrian Mariappa, Andre Carrillo, Ashley Barnes, Ashley Westwood, Burnley FC, Chris Wood, Daryl Janmaat, Etienne Capoue, Georges-Kevin N'Koudou, Jack Cork, James Tarkowski, Javi Gracia, Jeff Hendrick, Jose Holebas, Kevin Long, Kiko Femenia, Matthew Lowton, Nick Pope, Orestis Karnezis, Richarlison, Roberto Pereyra, Sam Vokes, Sean Dyche, Sebastian Prodl, Stefano Okaka, Stephen Ward, Troy Deeney, Watford FC, Will Hughes on April 8, 2018 by franelynn. After a week dominated by cold weather and snow disruption, it was a relief to end the week with some football. Although for that we need to give thanks to the large number of kind souls who were at Vicarage Road early in the morning to help clear snow from the stadium and ensure that the game could be played. Before 10am there was a notice on social media thanking the volunteers and saying that no more were needed. Well played Hornets fans. There was also a request from the 1881 for donations to the local foodbank. When I arrived with my tins just before midday, there was a nice collection beginning and, at the end of the day, the foodbank thanked the fans with a message that “nearly a quarter of a tonne of food” had been donated. A tremendous effort. When I arrived at the West Herts, there were a couple of unfamiliar faces who turned out to be Norwegian friends of Trond. One of them had been to Kaiserslauten home and away, which were his last Watford games before this one! After the unwelcome information midweek regarding the severity of Deulofeu’s injury, it was very disappointing when the team news came through to find that there was no sign of Femenía. Thankfully a follow-up message said that it was due to sickness rather than injury. Let us hope that he recovers very soon. I was greatly cheered by the news that Hughes was fit enough to take a place on the bench. Gracia’s only change from the Everton game was to replace Deulofeu with Carrillo. So the starting line-up was Karnezis; Janmaat, Prödl, Mariappa, Holebas; Doucouré, Capoue; Carrillo, Pereyra, Richarlison; Deeney. Former loanee, Ben Foster started for the visitors, who also had Allan Nyom on the bench. 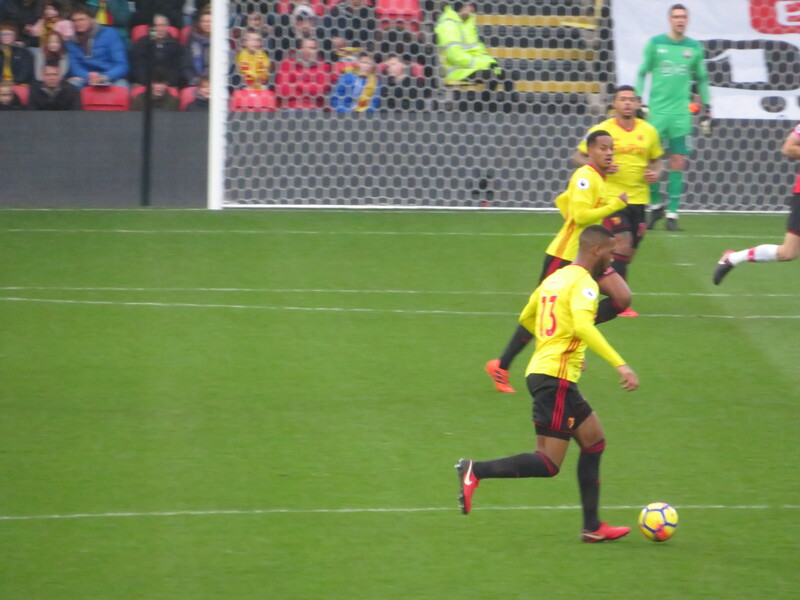 Mariappa was in action at both ends of the pitch, flicking on a corner that didn’t quite reach Deeney and then clearing Rondón’s cross after Capoue had lost out in midfield. A lovely attacking move for the Hornets finished as Doucouré found Deeney whose shot looked more like a back pass to Foster. The first card of the game went to Capoue who was booked for a clumsy collision, which seemed rather harsh. West Brom had a decent chance to open the scoring but, thankfully, Rondón’s header was wide of the near post. At this point attention was drawn to an advertising hoarding that appeared to be on fire, much to the amusement of the travelling Baggies who were singing “Watford’s burning down.” Back on the pitch, Doucouré tried a strike from distance that was blocked. There was then a great chance for the Hornets as Pereyra broke and found himself in space, he played the ball to Janmaat whose shot was goalbound until Foster stuck out a leg and deflected it wide. The resultant corner was headed just over the bar by Prödl. In the last minute of the first half, Holebas was penalised for a challenge on Rondón. He wasn’t impressed with the decision and let the officials know in no uncertain terms and was very lucky not to talk his way into the referee’s book, in fact he probably would have seen a card had Deeney not manoeuvred him out of earshot. The free-kick was taken by Brunt and landed on the roof of the net, so the half finished goalless. At half time, we were introduced to Lewis Gordon, the latest Academy graduate to sign as a professional. We also had the rather sorry sight of St Bernadette’s school taking part in the half time shoot out with only 2 of the 5 penalty takers. At first this appeared to be a ruse as the first penalty was excellent, but it was beginners luck and they were soon knocked out of the competition. As he approached the goal at the Rookery end for the start of the second half, Ben Foster was greeted with a tremendous reception to which he reacted with applause and by blowing a kiss to the crowd. How lovely. Watford had the first chance of the half from a Holebas free kick that Richarlison headed wide. The young Brazilian had another decent chance soon after, but ran into a crowd of players and lost the ball. At the other end there was a low shot from Rondón that was easily gathered by Karnezis. The West Brom man then had an identical chance from the opposite side, he struck this one with more power but, again, Karnezis was equal to it. Carrillo then broke on a counter attack and crossed for Doucouré who headed the ball down to Richarlison whose overhead kick appeared to be deflected wide by Livermore, but a goal kick was given. Rondón really should have opened the scoring but, again, directed a header wide of the target. Watford made their first substitution on 54 minutes as Richarlison made way for Okaka. Young Ricky was not happy and threw his gloves to the ground as he reached the dugout. Thank goodness his Uncle Heurelho was there to look after him. Okaka made an immediate impact playing a lovely through ball for Deeney who, sadly, wasn’t ready for it. Then Doucouré tried to play in Okaka, but the ball bounced off the Italian and the chance was gone. 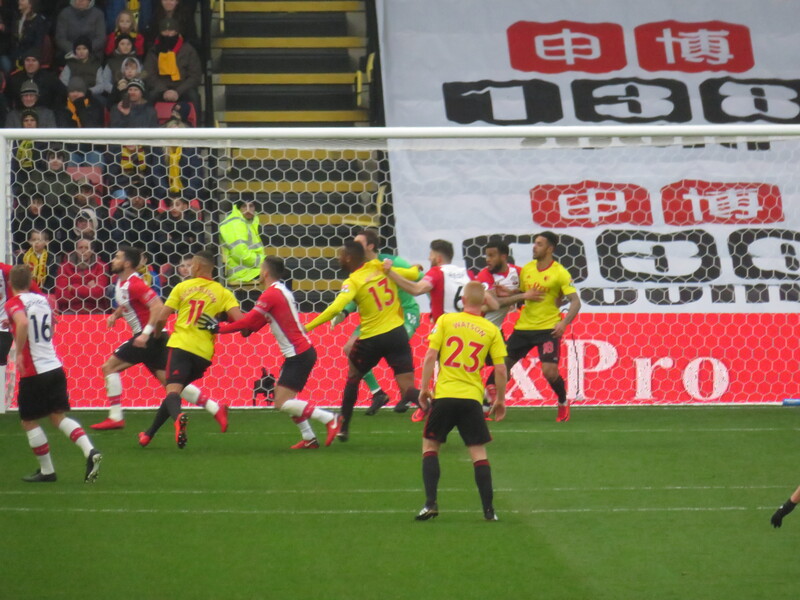 Watford were coming closer to breaking the deadlock and the next chance came as a cross from Pereyra reached Carillo whose shot was just over the bar with Foster beaten. That was the last contribution from the Peruvian who was immediately replaced with Hughes. We then had the bizarre experience of a player doing the time-wasting trudge off the pitch when there were still 24 minutes to go and he game was goalless. Even his own fans were booing Carrillo before he reached the dugout. West Brom had a great chance to take the lead as a cross came in for Rodriguez, but Janmaat made a vital intervention to stop the shot. Mariappa earned a booking after losing Rondón and then hauling him down to stop his escape. Watford should have taken the lead with 15 minutes remaining as a corner from Holebas reached Okaka in the box with the goal at his mercy, but his shot was blocked by Gibbs on the line. The Hornets took the lead in the next move as a mistake in the West Brom midfield gifted Hughes the ball and he played a perfect pass for Deeney to run on to, Foster came out to meet him, but Troy was focussed on the goal and lifted the ball over Foster to send the Rookery wild. The first substitution for the visitors saw McClean on to replace Krychowiak. Mariappa, who had been tremendous, nearly put the Hornets in trouble with a terrible back pass but Karnezis was off his line to prevent Rondón taking advantage. 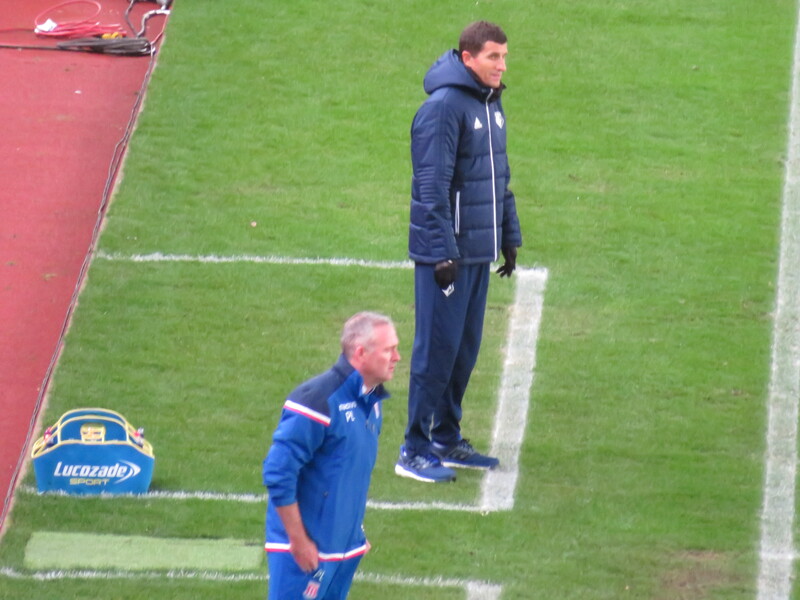 West Brom made two late substitutions with Livermore and Rodriguez making way for Field and Burke. A deep corner from West Broom looked threatening, but Karnezis came confidently to claim the ball. In time added on there was a decent chance for Hughes to increase Watford’s lead but his shot was deflected to Foster. 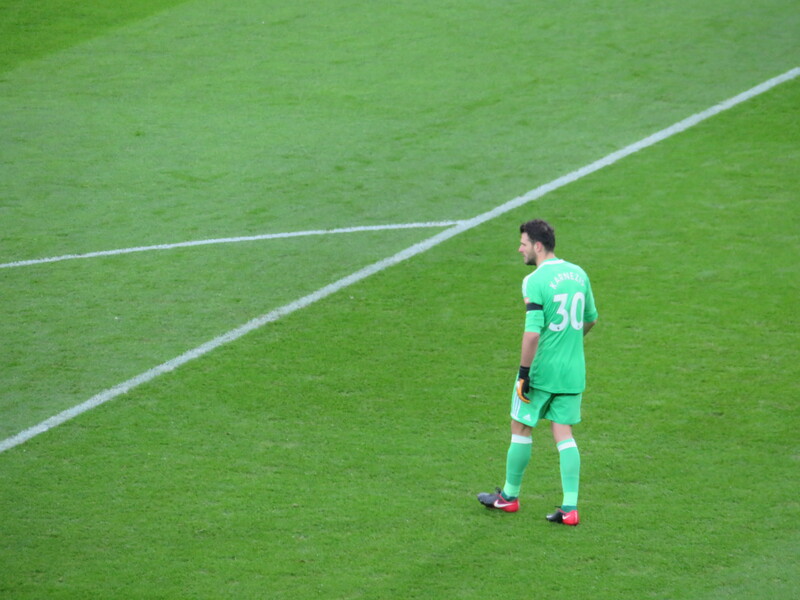 Gracia had intended to make a third substitution, bringing Lukebakio on for the final minute or so, when Holebas went down injured, so Britos was brought on to replace the limping Jose. In the final minute of the game Watford won a free kick and I was baffled when Okaka went over towards the ball, leaving no one in the box, until the ball was played short for him to keep it in the corner until the final whistle went. It had been another poor game, but another great three points. On his 250th start, it was rather lovely that Mariappa was given man of the match. It was also pleasing to see Deeney score his second goal in successive games. His goals have been few and far between this season, but these were crucial to our survival in this division. And there was a warm welcome back to Will Hughes, who provided the pass that led to the goal. This win took us to 9th in the table and really has to mean that we are safe from relegation, which is a bit of a relief as our next two games are against Arsenal and Liverpool, although neither of those clubs are models of consistency, so points against them are not out of the question. On our way back to the station, we met a group of West Brom fans trying to find their way back to The Flag. They were very philosophical about our putting the final nail in their coffin which made me even happier that we could look forward to the last few games without stressing about the results. This entry was posted in Watford FC and tagged Abdoulaye Doucoure, Adrian Mariappa, Ahmed El-Sayed Hegazi, Alan Pardew, Andre Carrillo, Ben Foster, Chris Brunt, Craig Dawson, Daryl Janmaat, Etienne Capoue, Grzegorz Krychowiak, Jake Livermore, James McClean, Javi Gracia, Jay Rodriguez, Jonny Evans, Jose Holebas, Kieran Gibbs, Matt Phillips, Miguel Britos, Oliver Burke, Orestis Karnezis, Richarlison, Roberto Pereyra, Salomon Rondon, Sam Field, Sebastian Prodl, Stefano Okaka, Troy Deeney, Watford FC, West Bromwich Albion FC, Will Hughes on March 4, 2018 by franelynn. 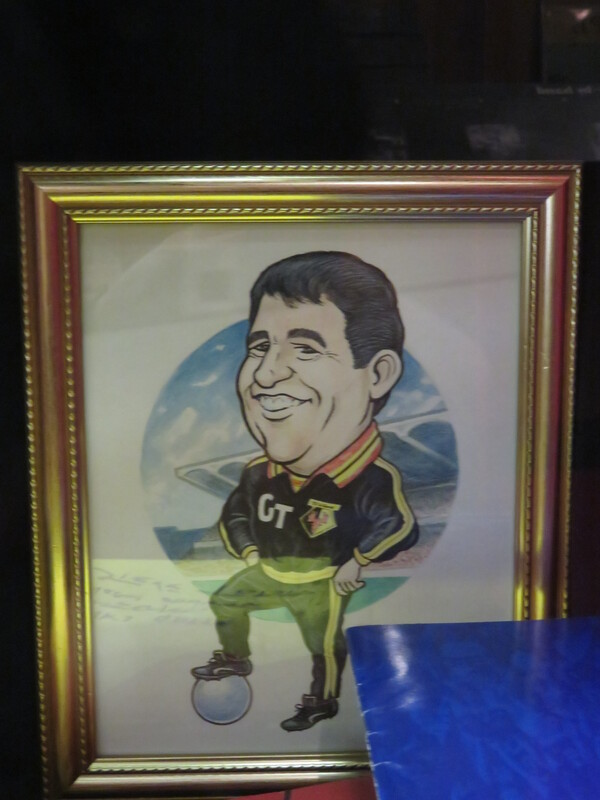 With the game kicking off at 5:30pm and it being the last day of the Graham Taylor exhibition at the museum, there was no question about how I would start my afternoon in Watford. My sister, Rose, joined me and we spent a lovely hour looking at the exhibits and reminiscing. There were a couple of new additions since my previous visit, including a beautiful painting/collage by Terry Challis, which was well worth the repeat visit all on its own. Rose had not seen the exhibition before, so dutifully went around with the list of exhibits ticking them off. We also had the added unexpected pleasure of Sarah Priestley being on hand to talk us through the collection and her lovely meetings with Rita while putting it together. Apparently, Rita has visited on a few occasions and had fans chatting to her about their memories of Graham before they realised who they were talking to. I have to say that brought a tear to all of our eyes. As we walked to the West Herts, we encountered a group of Everton fans piling off a coach at the traffic lights at the junction of Vicarage Road so that they could visit the Oddfellows. When one started a chorus of “Hi ho Silva lining”, I remembered that this was a grudge match. When we met up with our pre-match crew, Elaine was there without her Everton-supporting husband in tow. “He’s banned. He couldn’t get a ticket in the away end and I wouldn’t give him his Fan ID.” Brilliant! The main talking point surrounding the Watford team selection focused on the goalkeeping position. With Gomes back from injury would Gracia grant him an immediate return to the starting XI or keep faith with Karnezis who has been performing well and has certainly overcome the doubts raised by his performance when he came on as substitute at Goodison Park? When the team was announced, Karnezis was indeed retained, Gracia’s only change was to bring in Pereyra for Zeegelaar. So, the starting line-up was Karnezis; Janmaat, Mariappa, Prödl, Holebas; Doucouré, Capoue; Deulofeu, Pereyra, Richarlison; Deeney. I must say that I was very pleased indeed to see Femenía named among the substitutes. We have missed him. Despite the forecast of bitter cold, I had left home without a scarf. I agonised about buying a new one as the scarf that I wore at Goodison Park had never been seen at a game before and we all know what happened that afternoon. But it was far too cold to do without, so I took the risk. Before kick-off, the 1881 launched streamers into the Rookery. With the flags also out in force I am sure that it was a great spectacle for those watching on television. The first half-chance of the game came from an Everton free-kick which fell for Niasse, who failed to connect and the chance was lost. Watford’s first chance came from a corner which fell to Doucouré whose shot was way off target. Everton threatened again as Niasse tried to sneak the ball in from a narrow angle, but Karnezis was alert and blocked the attempt. The next chance for the visitors fell to Sigurdsson, but his shot was soft and straight at Karnezis. There were howls for a yellow/red card as Keane put in a rather robust challenge on Doucouré, but the referee waved play on. Than a dangerous looking cross from the visitors was dealt with by a wonderful header from Mariappa. Watford should have done better after launching a dangerous looking break, but Deulofeu’s shot was blocked and Capoue’s follow-up was high and wide. And that was it for the first half. It had been a remarkably dull game with most of the excitement of the first half deriving from having to fight off streamers that had detached themselves from the roof. At half time, Academy Day at Vicarage Road was marked with the under 9s being put through their paces before parading around the ground. We also had Under 23 player Andrew Eleftheriou talking about his progression through the academy and stressing the need for hard work. The second half started brightly and there was an early chance for the Hornets as a corner reached Prödl, but his header was over the target. There was danger from the visitors as a cross from Walcott found Keane unmarked, but his header flew wide, much to my relief. 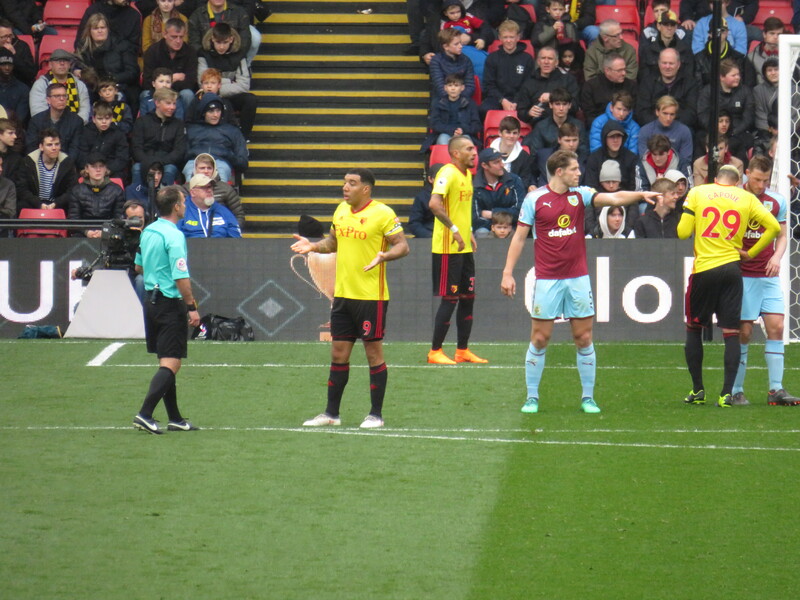 Given some of the tackles that had passed without caution in the first half, it was a little surprising that the first card of the game went to Capoue for a challenge on Walcott that was clumsy rather than malicious. 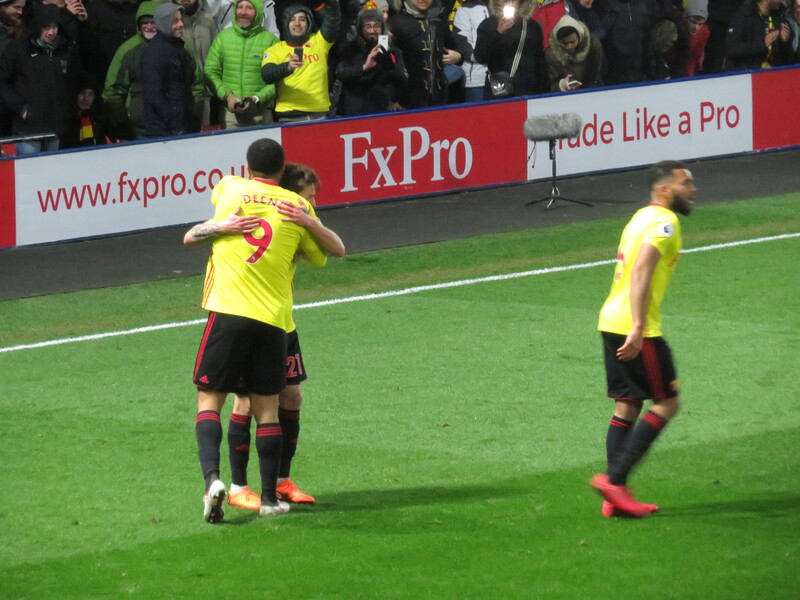 Watford had a decent chance to open the scoring as a lovely cross from Pereyra was met by the head of Deeney, but Pickford was able to gather. Just before the hour mark, Gracia made his first changes as Pereyra and Richarlison made way for Okaka and Femenía. At the same time, Tosun replaced Niasse for the visitors. I must admit that I can’t help but feel sad when Richarlison is replaced, but it was immediately apparent that the substitutes made a difference. 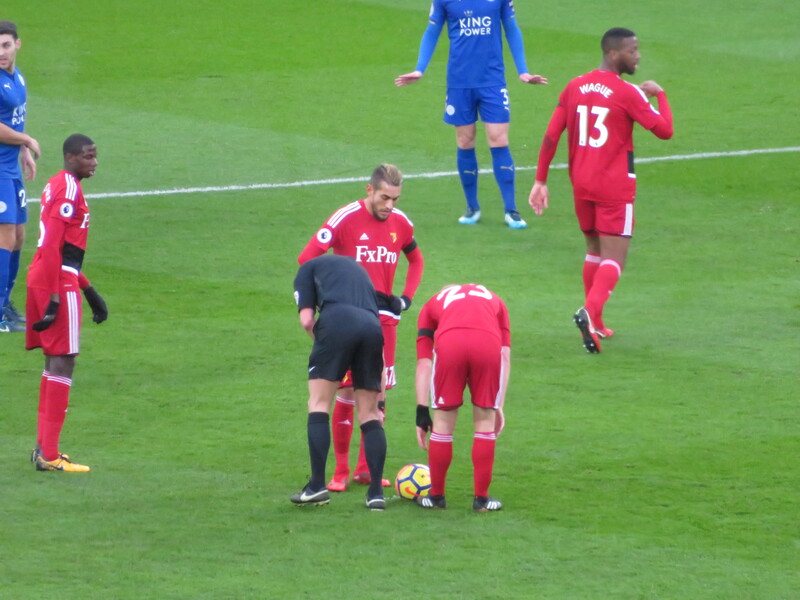 On a day when we were celebrating the return from injury of a couple of players, it was frustrating to see Deulofeu go down needing treatment. He came back on, but his first attempt at a run resulted in him dropping to the ground again and he had to be replaced by Carrillo, who is now a bottle blond. The first caution for Everton was earned by Gueye who took down Okaka as he tried to break. The next goal chance fell to Rooney, who tried a volley from the edge of the box, thankfully he didn’t make a good contact and the ball flew over the target. This was followed by a lovely move from the Hornets which finished with a cross from Okaka that went begging. Soon after, a cross from Femenía was cleared only as far as Capoue, but his shot was off target. Then a clearance from Pickford hit Deeney and rebounded to Femenía whose shot needed a decent save from the Everton keeper to keep it out. But the Hornets were not to be denied as Femenía broke forward and fed Okaka who crossed for Deeney who powered an absolute beast of a shot past Pickford. It was one of those moments when I love sitting behind the goal as that ball was coming straight for us as we rose as one to celebrate. Allardyce immediately made a couple of changes replacing Rooney and Sigurdsson with Calvert-Lewin and Bolasie. But it was Watford who continued to attack as Holebas went on a terrific run up the wing, he played in Okaka who beat a defender before shooting but Pickford was able to make the save. As the clock ticked down, the Hornets were looking to keep the ball in the corner, but this is always a risky tactic and, needless to say, the visitors launched one last attack and won a corner. I heard “Here we go,” from behind me which matched my thoughts and fears exactly. Pickford went up to join the attack and there was an almighty scramble in the Watford box and, as Karnezis dropped to make a save, I thought the ball had gone in, so was mightily relieved when I realised that the Watford keeper had smothered the ball and the three points had gone to the Hornets. There was an almighty roar at the final whistle and much celebration as the players did their lap of honour. As always, Deeney was the last to reach the Rookery and was given a well-deserved hero’s welcome. We left the ground with smiles on our faces and Elton’s “I guess that’s why They Call it the Blues” ringing in our ears! The post match consensus was that it had been a terrible game, but a great three points. Watford ended the day in 10th place (back in the top half) and, while we are only 6 points off the relegation zone, you have to think that the win has ensured safety for this season. It was a match of little quality, but Watford made the majority of the chances that there were and just about deserved the win based on the second half performance. I blow hot and cold with Okaka, but he was`excellent, making forward moves when many of his team mates were happy to pass sideways and backwards. He provided the assist for Deeney, as well as nearly scoring a second. It was also wonderful to see Femenía back on the pitch. He certainly showed why we have missed him. With West Brom the visitors next week, I have that sinking feeling about a banana skin, but there is certainly a new spirit around the club, so I hope that the players show what they can do. Another three points will certainly calm a lot of nerves and allow us to enjoy the end of the season. This entry was posted in Watford FC and tagged Abdoulaye Doucoure, Adrian Mariappa, Andre Carrillo, Ashley Williams, Cenk Tosun, Cuco Martina, Daryl Janmaat, Dominic Calvert-Lewin, Etienne Capoue, Everton FC, Gerard Deulofeu, Gylfi Sigurdsson, Idrissa Gana Gueye, Javi Gracia, JonJoe Kenny, Jordan Pickford, Jose Holebas, Kiko Femenia, Michael Keane, Orestis Karnezis, Oumar Niasse, Richarlison, Roberto Pereyra, Sam Allardyce, Sebastian Prodl, Stefano Okaka, Theo Walcott, Tom Davies, Troy Deeney, Watford FC, Wayne Rooney, Yannick Bolasie on February 25, 2018 by franelynn. Why is it that when you are taking the afternoon off work, nobody speaks to you until a couple of minutes before you are due to leave and then it is a crisis that has to be dealt with? I must have appeared very rude as I packed my bag and changed into my walking shoes while answering the questions coming my way, but I had a train to catch. Once I left the office, it was a nice easy journey to Stoke, and having opted to travel first class, there was the delight of a glass of wine with my late lunch. When I arrived at the hotel, I was happy to see a number of regulars milling around the foyer and the bar. I was soon joined by my companions for the evening and we headed for the pub. The pre-match pub at Stoke is lovely. In previous years it has had a sign indicating that it is home fans only (not that we have ever been turned away). That was missing on this occasion and, as always, there was a nice mix of home and away fans present. One of the main topics of conversation was the dreadful behaviour of the Watford fans at Southampton and the belief that we wouldn’t be seeing that section of the support on a cold night in Stoke. We set off for the ground in plenty of time. I must admit that the walk along the towpath isn’t the most picturesque in daylight. On a dark Winter’s evening, there was nothing to see but the lights of the stadium which shone in the distance welcoming us. Team news was that Gracia had made four changes for his first game in the Premier League giving a debut to Deulofeu in place of Carrillo, with Deeney, Cleverley and Prödl coming in for Gray, Watson and Janmaat. So the starting line-up was Karnezis; Mariappa, Kabasele, Prödl, Holebas; Doucouré, Cleverley; Deulofeu, Capoue, Richarlison; Deeney. Watford started brightly as a cross from Holebas was met by Prödl, but Butland was equal to the shot. The first chance for the home side came as a cross from Adam was flicked wide by Diouf. Watford had a great shout for a penalty as Deulofeu appeared to be thrown to the ground in the box, but the referee saw no infringement. Then Richarlison pulled the ball back for Cleverley whose shot was over the bar. The first booking of the game was earned by Kabasele for a push on Shaqiri. Stoke earned their first booking soon after when Adam was cautioned for a trip on Richarlison. At this point in the game, I couldn’t help but notice how different the crowd were from Saturday. 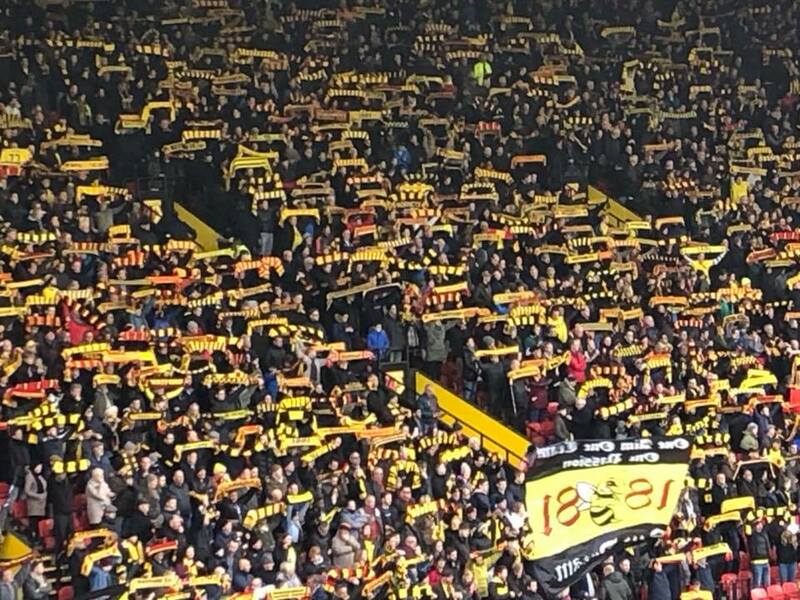 Lots of positive chants in support of our team and, on transfer deadline day, there was a lot of love for Deeney and the fact that he would finish the season as a Watford player. The home side had a great chance to open the scoring as a quick break finished with a shot from Adam that was stopped by a brilliant block from Mariappa, Choupo-Moting picked up the loose ball and curled a shot just wide of the far post. It was then Watford’s turn to break forward and Butland needed two attempts to gather the cross from Holebas. Bauer was the next to be cautioned for a nasty tackle on Cleverley. His reaction was pure outrage pointing out that he had played the ball (as well as the man). Utterly ridiculous. 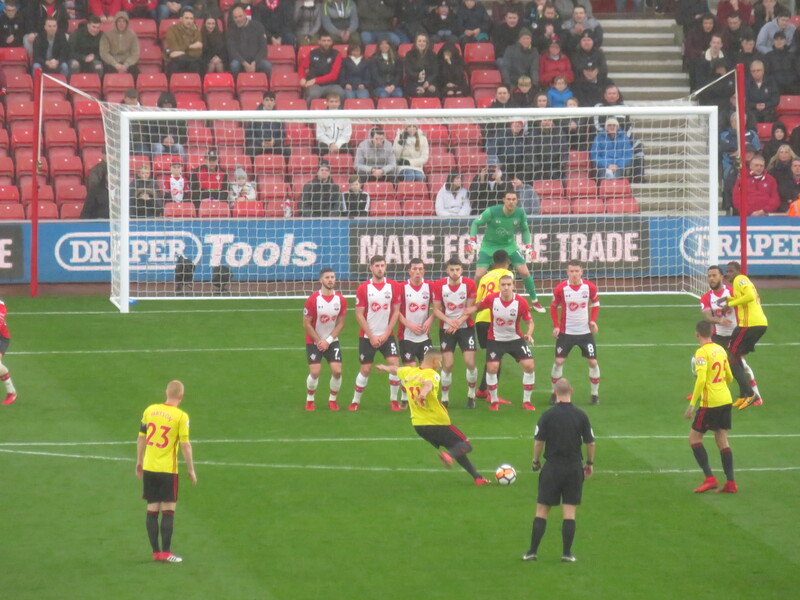 A decent free-kick from Holebas was headed goalwards by Doucouré, but Adam managed to clear the shot off the line. The resultant corner from Holebas bounced off the crossbar. Watford threatened again when Cleverley picked up a loose ball in midfield, he played a square ball to Doucouré whose weak shot was easy for Butland. 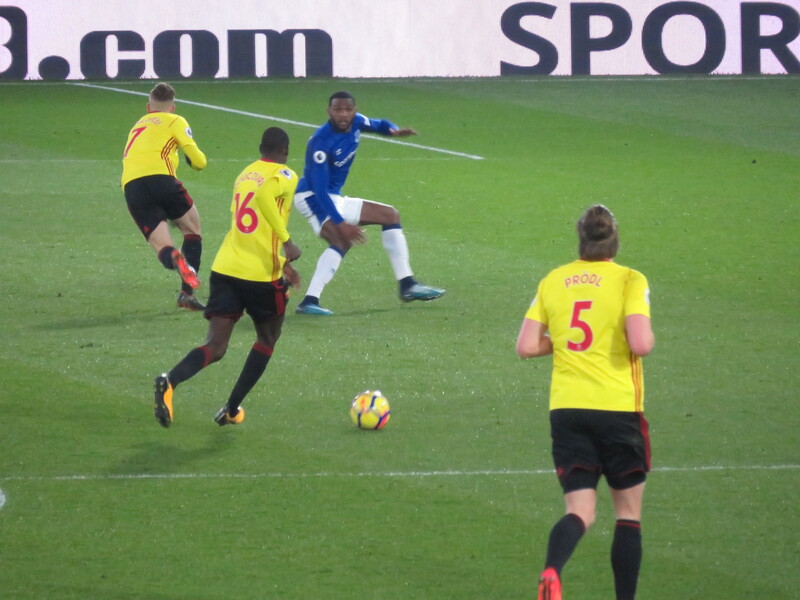 The final chance of the half fell to the Hornets as Deulofeu broke forward and crossed for Richarlison whose shot flew over the bar. As the players walked towards the tunnel in the corner by the away fans for the half time break, they were cheered off the pitch. It had been a much better performance than of late, with considerably more effort and energy on show. 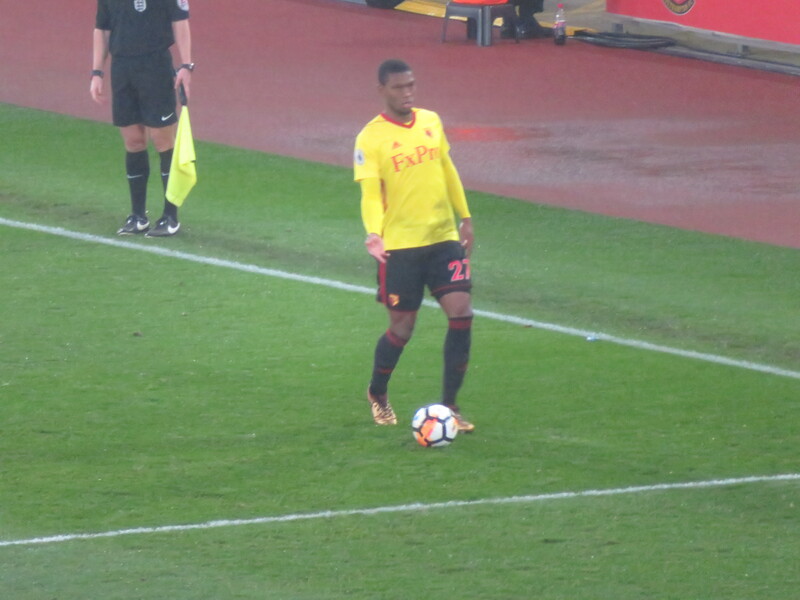 Deulofeu had made a lively debut, Mariappa had done very well fitting in at right back and even Capoue had put in a decent shift. The first action of the second half was a booking for Holebas for a foul on Diouf. Adam took the free kick, his low shot was easy for Karnezis. There was another booking when Kabasele was knocked to the ground by Diouf. I didn’t see the foul, but a number of comments post-match indicated that his reaction to the contact was over the top, which was interesting as the other Watford players reacted as if it had been a nasty challenge. 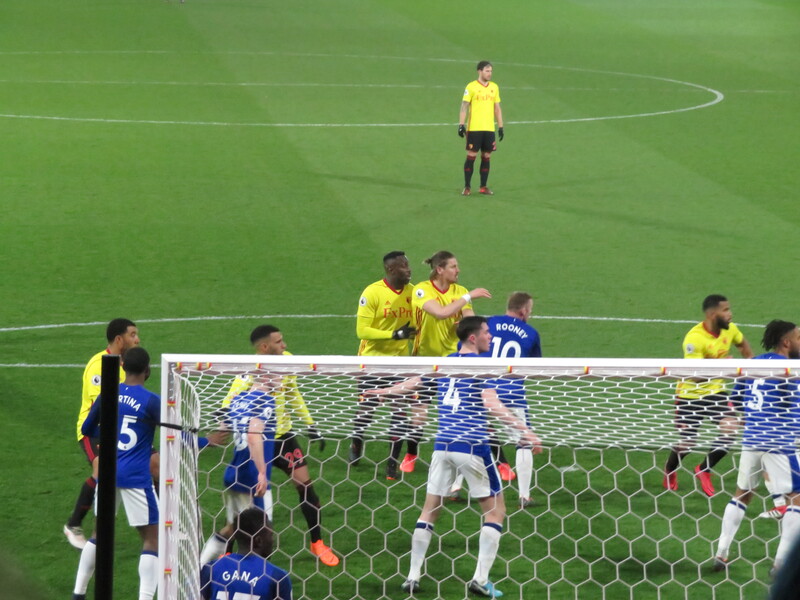 A lovely Watford move started with a break by Doucouré, who found Deulofeu, he flicked the ball on to Richarlison whose shot was deflected wide. From the corner there was a total mishit from Deulofeu, allowing Stoke to break down the other end where Allen shot over the target. Stoke made a substitution just before the hour mark replacing Adam with Crouch. We had Karnezis to thank for keeping the game goalless as he pulled off a superb double save, first from Shaqiri, then the rebound from Crouch. 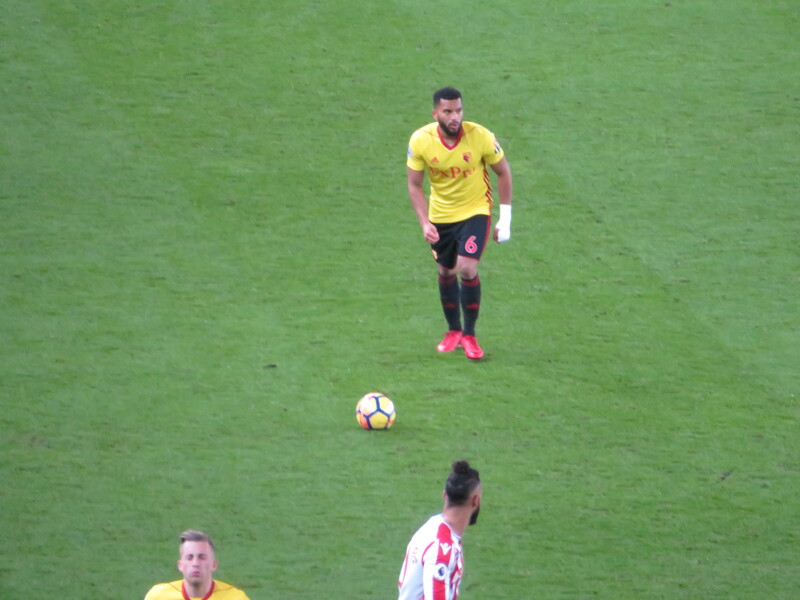 The Stoke substitute was having a lively start to the game and, soon after, he got on the end of a cross from Diouf but was forced to turn it wide under pressure from Mariappa. 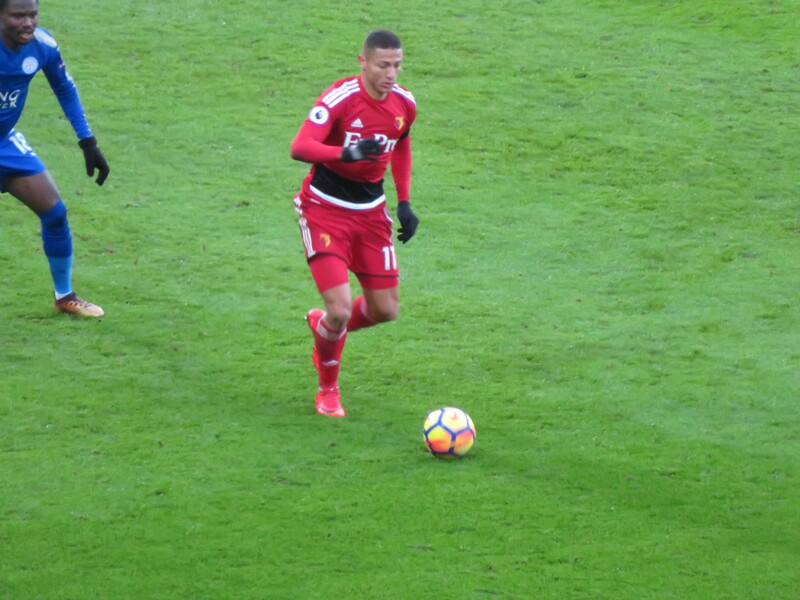 Watford’s first substitution saw Richarlison make way for Gray. I have to say that the young Brazilian appeared devastated at being taken off. The Watford substitute was soon involved in the action as he played the ball to Doucouré whose shot was stopped by a great block from Shawcross. 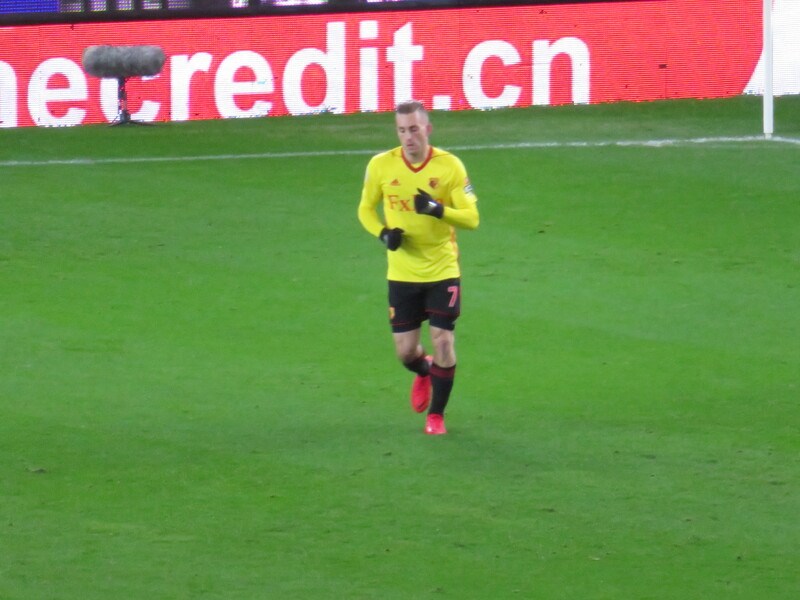 Watford’s next substitution was enforced as Pereyra came on for Cleverley who had appeared to go down with a hamstring injury. The Stoke fans were less than sympathetic yelling at him for being a cheat. Charming! Watford continued to look for the breakthrough as Doucouré won the ball in the midfield before finding Pereyra whose shot was deflected for a corner. There was an even better chance in the next move after Deulofeu beat a couple of players before the ball found its way to Pereyra but, again, Butland was equal to the strike, pushing it out for a corner. The set piece was played out to Doucouré who shot wide of the target. 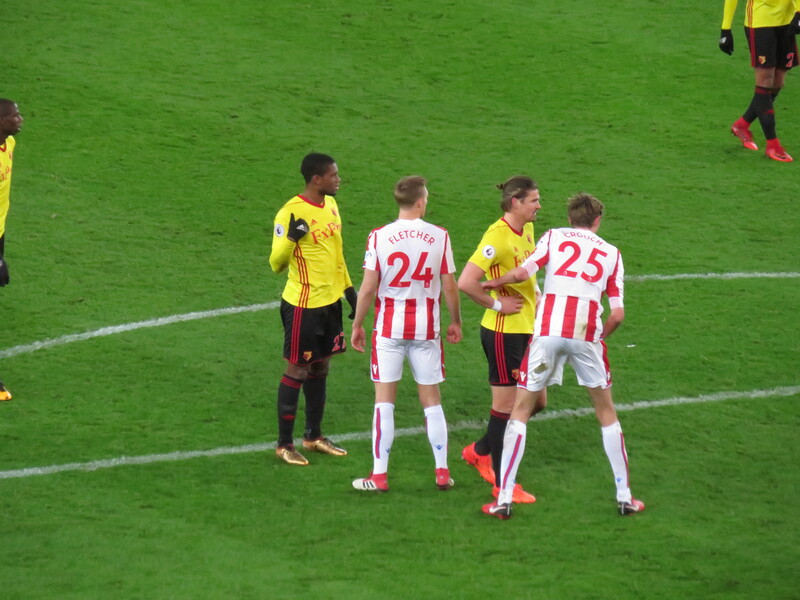 There was a late change for each side as Berahino replaced Diouf and Carrillo came on for Deulofeu, who went off to appreciative applause from the travelling Hornets. The last chance of the game fell to the home side as a corner from Shaqiri was met by the head of Shawcross, but it was an easy save for Karnezis and the game finished goalless. It was a game of little quality, but plenty of action and endeavour and I thoroughly enjoyed it. At the end of the game, the players were warmly applauded and Pereyra and Kabasele, who had been abused at the end of the previous game, handed over their shirts to smiling fans. While a goalless draw at Stoke wouldn’t be everyone’s idea of a good night out, it was a point well won and I left the ground with a big smile on my face. After a swift glass of red at the pub, we headed back to the hotel and spent a late night in the lounge with a large number of Watford fans. Everyone in attendance had thoroughly enjoyed the performance and were happy to have been part of a more positive crowd. One fan had actually contemplated staying at home due to the unpleasantness of the crowd on Saturday. Thankfully he hadn’t and had his faith in his fellow fans restored. The rest of the season will not be easy but there were more than enough positives in that performance and, if we all pull together, we could have an end to the season that is as much fun as the start was and that is something to look forward to. This entry was posted in Watford FC and tagged Abdoulaye Doucoure, Adrian Mariappa, Andre Carrillo, Andre Gray, Charlie Adam, Christian Kabasele, Darren Fletcher, Eric Maxim Choupo-Moting, Erik Pieters, Etienne Capoue, Gerard Deulofeu, Jack Butland, Javi Gracia, Joe Allen, Jose Holebas, Kurt Zouma, Mame Biram Diouf, Moritz Bauer, Orestis Karnezis, Paul Lambert, Peter Crouch, Richarlison, Roberto Pereyra, Ryan Shawcross, Saido Berahino, Sebastian Prodl, Stoke City FC, Tom Cleverley, Troy Deeney, Watford FC, Xherdan Shaqiri on February 4, 2018 by franelynn. Due to unfavourable rail connections, I ended up reaching Southampton ridiculously early and my first attempt to enter the pub of choice was greeted with a locked door and a dog barking to warn me off. Luckily Richard arrived very soon after me, so I had delightful company as we waited in the cold and wet for the clock to strike 12. Arriving early meant that we secured a great table for our party, which soon filled up as subsequent trains (and a car from Cheshire) arrived and we raised a glass to absent friends, particularly remembering Toddy whose last away trip had been to St Mary’s. Pre-match talk was about the new manager and whether he could arrest the current slide, so the team news was eagerly awaited. Gracia’s first team showed four changes (two enforced) as Wagué, Deeney, Zeegelaar and Pereyra made way for Mariappa, Holebas, Capoue and Gray. So the starting line-up was Karnezis; Janmaat, Mariappa, Kabasele, Holebas; Doucouré, Watson; Carrillo, Capoue, Richarlison; Gray. So, the new manager was also opting for one up front, although, in the absence of Deeney, that seemed a sensible choice. 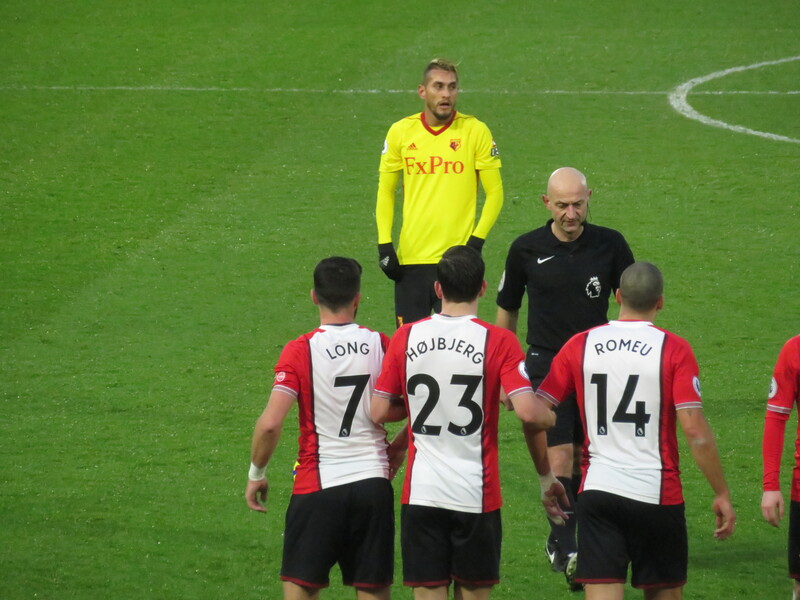 The game started in the worst way possible as a free kick from Boufal was met by Long whose shot was parried by Karnezis, Stephens was first to the rebound and beat the Watford keeper to open the scoring. From two rows in front I heard “Are you Silva in disguise?” It was going to be a very long afternoon. The home side threatened again as Long crossed for Tadić, but his effort missed the target. Watford’s first chance came from a free-kick, Richarlison stepped up to take it and curled his delivery just wide. At the other end Long met a cross from Cédric and headed just wide. A foul on Kabasele was met with a chant of “Same old Watford, always cheating,” which I guess was deserved after the Watford fans had gleefully sung “He scores with his hands” in honour of Doucouré. Watford finally had some time on the ball but a lovely passing move finished with a terrible shot from Watson that flew well wide. This was greeted with “What the f*ing hell was that” from the away fans. 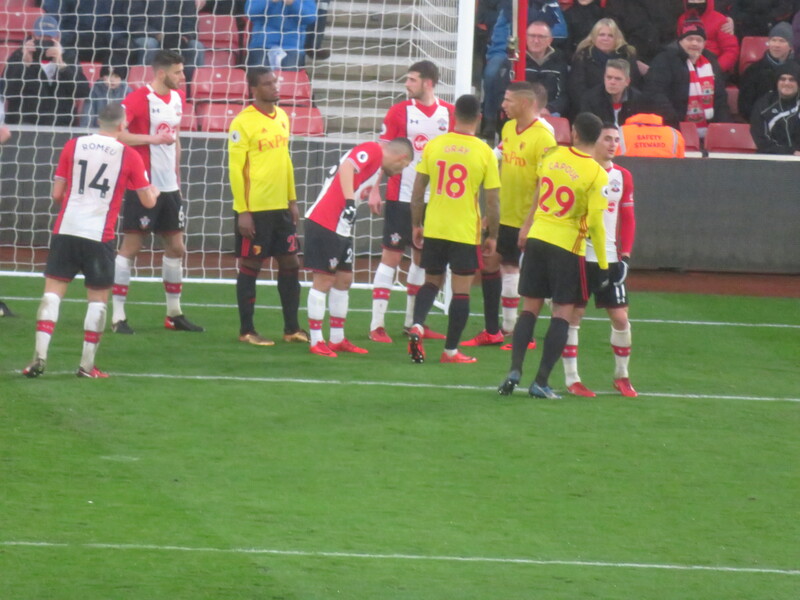 Southampton threatened again after Doucouré lost out to Long who broke into the box, but Karnezis was able to make the save. The Watford keeper was called into action again soon after as Cédric tried a shot from distance, Karnezis dropped to make the save. The home side were forced into a substitution due to an injury to Bertrand who was replaced by Pied. Southampton had a great chance to increase their lead as Cédric hit a cross that flew just past the far post as Long failed to connect. As half time approached, Mike was urging the team to get an equalizer and, as Richarlison hit a cross, there was an exasperated cry of “Not like that,” but he was made to eat his words as McCarthy had to back pedal to tip it over the bar. Watford had another chance as a cross from Richarlison reached Holebas whose header from the byline was straight into the arms of McCarthy. Not for the first time in recent games, the half time whistle was greeted with boos from the away end. The half time entertainment at Southampton was a relay race in which participants are stationed at the corners and on the half way line. A football is carried and passed between team mates until the last player gets the ball and then dribbles towards the goal to score and win the game. On Saturday, the green team went off like a rocket and were well in the lead when the final player received the ball, but he appeared to want to score the perfect goal, while the lad in purple belted towards the goal and took an early shot and won the game for his team. I hope that Gracia gets a video of this to show the lads as there was definitely a lesion to be learned. The other action of interest at half time was Okaka coming on to warm up and being greeted with joyous cheers from the away end. I suspect that those who were so thrilled at his impending introduction had missed the trip to Leicester. But he had the second half to dispel that memory as he came on to replace Capoue. Watford’s final substitution saw Janmaat making way for Sinclair. Watford threatened as a cross from Richarlison was deflected for a corner. The delivery from Holebas was headed goalwards by Doucouré, but was blocked by a defender and he protested that it had hit a hand. The irony! Richarlison then played a cross-field pass to Sinclair whose shot was terrible, flying high and wide, but he was hardly going to be encouraged by his own “supporters” singing “f*ing useless” at him. Southampton made their final substitution replacing Tadić with their new signing, Carrillo, to great excitement from the home fans. But it was Watford who finished the game more positively, with a couple of late chances to earn a replay. First a shot from Richarlison was charged down. Then a Pereyra cross was met by an overhead kick from Okaka that flew over the bar. Finally, in time added on, the best chance of the lot as Kabasele met a cross from Holebas with a header that flew just wide of the near post. The final whistle prompted some ugly scenes in the away end. There were three men behind my niece and I, screaming abuse at the players. As this went on, Amelia was infuriated shouting, “Don’t come to games then,” as she applauded the players with more enthusiasm than the performance deserved. Those men then got into a heated argument with another fan in our row. Meanwhile, a couple of rows in front, an exchange of profanities between a couple of fans evolved into a punch-up. The players were not immune from the unpleasantness as Kabasele came over to applaud the crowd and was subjected to a volley of abuse that clearly upset him. Holebas was on the end of the same treatment and looked furious, with Ben Watson pushing him away from his abusers. As poor as the performance on the pitch had been, this was disgraceful behaviour from some in the Watford crowd and must have made Gracia think twice about the “family feel” that he said pre-game he had experienced at Watford. More than one person mentioned yesterday that I usually find something positive to say about games. Sadly, I cannot find anything good to say about that game either on or off the pitch. But I will be off to Stoke on Wednesday, more in hope than expectation of a win, but very hopeful that the travelling fans will get behind their team instead of spending most of the ninety minutes abusing them. This entry was posted in Watford FC and tagged Abdoulaye Doucoure, Adrian Mariappa, Alex McCarthy, Andre Carrillo, Andre Gray, Ben Watson, Cedric Soares, Christian Kabasele, Daryl Janmaat, Dusan Tadic, Etienne Capoue, Guido Carrillo, Jack Stephens, Javi Gracia, Jeremy Pied, Jerome Sinclair, Jose Holebas, Mauricio Pellegrino, Maya Yoshida, Orestis Karnezis, Oriol Romeu, Pierre-Emile Hojbjerg, Richarlison, Roberto Pereyra, Ryan Bertrand, Shane Long, Sofiane Boufal, Southampton FC, Stefano Okaka, Steven Davis, Watford FC, Wesley Hoedt on January 28, 2018 by franelynn. the pub suddenly filled up, so my early arrival didn’t look so foolish after all. However my long wait meant that I became irrationally concerned when my friends didn’t arrive. I only relaxed when the last of our depleted party was at our table. On arrival at the ground, the search teams were operating a queuing system, using metal detectors (yes that is a phone and some coins in my pocket) and a sniffer dog. Thankfully we had left ourselves plenty of time to get to the ground so did not miss kick-off on this occasion. As there had been no discussion of the team prior to arrival at the ground, it was only when the ball was played back to the Watford keeper early in the game that I realised that Karnezis was in goal for the Hornets. After his performance at Everton, this was a cause of some concern. Silva’s other changes were Pereyra and Deeney in for the injured Cleverley and Gray. So the starting line-up was Karnezis; Janmaat, Wagué, Kabasele, Zeegelaar; Doucouré, Watson; Carrillo, Pereyra, Richarlison; Deeney. In line with other Premier League clubs, there was a minute’s applause for the wonderful Cyrille Regis, who passed away earlier this week. Those of us of a certain age were deeply saddened at his early death. He was a wonderful player to watch and one who was a trailblazer for the young players of colour that have followed him. It is just heartbreaking that many of them are still suffering abuse related to their colour. But, thankfully, racist abuse is not something that is evident at every game as it was in the 70s and 80s. Watford started brightly enough with a couple of corners in the first minutes of the game, from the second Carrillo shot over the bar. 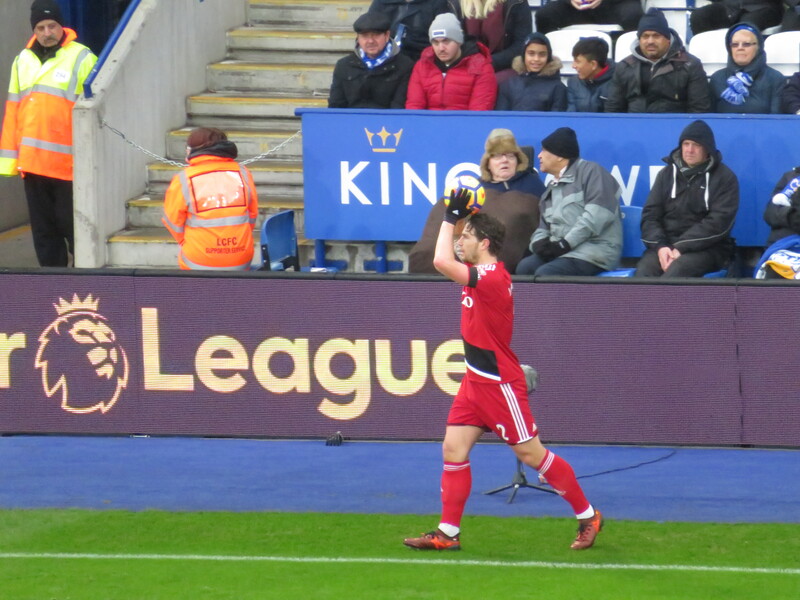 Leicester looked to hit the visitors on the counter attack as Vardy broke forward but his shot was saved by Karnezis, who I was pleased to see was looking assured in the Watford goal. The Watford keeper was called into action again soon after as a free kick was nodded back to Ndidi, but the shot was blocked. 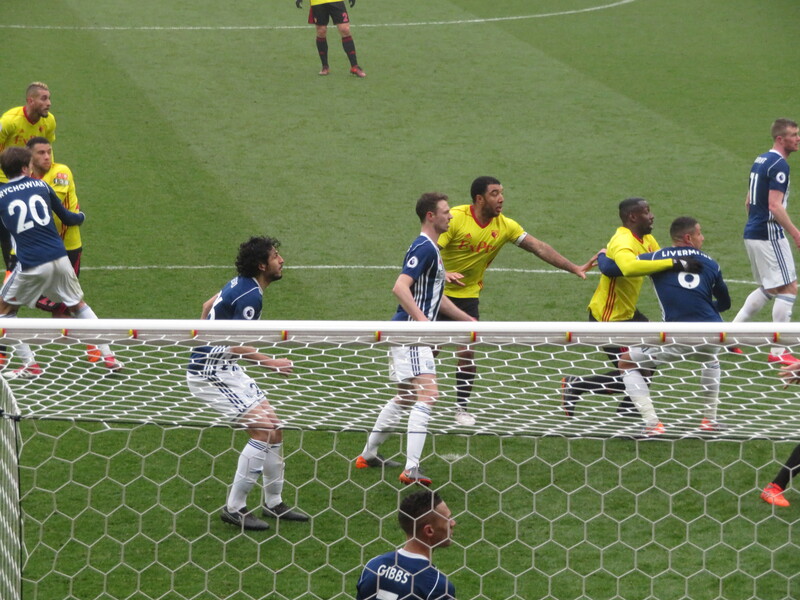 At the other end, there was a good spell for Watford as a Richarlison shot was blocked, a follow-up header from Pereyra was cleared off the line, the ball rebounded to Doucouré on the edge of the area, but his shot was easily gathered by Schmeichel. 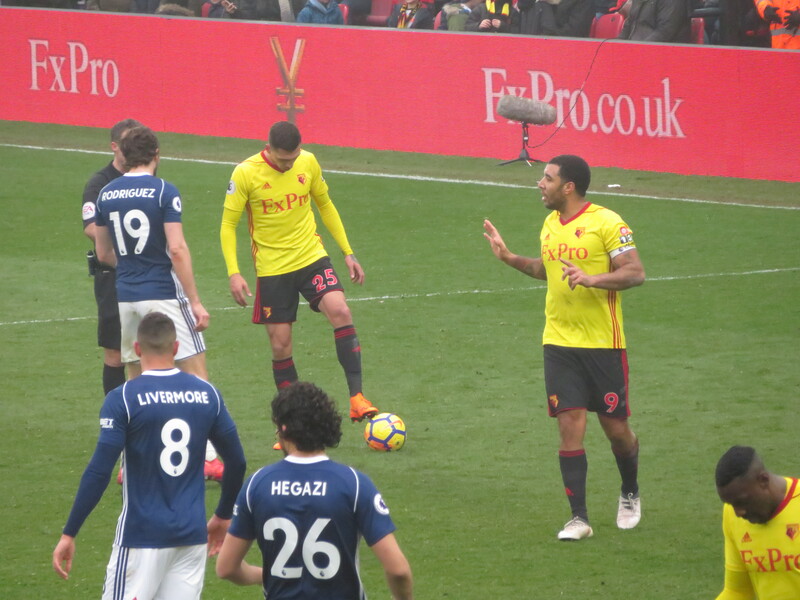 Watford threatened again as Pereyra took a short free kick to Watson, whose shot was blocked, Pereyra hit the follow-up which flew high and wide. Deeney was the next to try his luck with a low shot from distance, but Schmeichel was down to save. The lino in front of the away fans incurred their wrath when Vardy appeared to be in an offside position when he received a ball from Mahrez and was allowed to continue, when he then lost out to Kabasele, the defender was adjudged to have committed a foul. Justice was done when Mahrez curled a dreadful free kick straight to Karnezis. Watford appeared to have opened the scoring on 34 minutes when Carrillo headed the ball on to Deeney who volleyed home, but the flag was up for offside. As happens so often these days, the opposition then took the lead. From our vantage point, Wagué took the ball off Vardy in the box fairly, but the Leicester player went down and the referee pointed to the spot. Vardy stepped up and buried the penalty. The comment in my notebook at this point is not fit for a family blog. So the Hornets went in at half-time a goal down, which was harsh as it had been a very even half. Watford had a chance to strike back in the first minute of the second half as Carrillo crossed for Deeney, but the shot was blocked. At the other end Vardy was allowed to nip in behind the defender, he crossed for Okazaki whose shot was straight at Karnezis. Silva made his first substitution bringing Gray on for Pereyra. He was immediately forced into his second as Wagué had pulled up with what appeared to be a hamstring strain and was replaced by Prödl. Watford continued to push for the equalizer as Richarlison found Deeney but the captain’s shot flew just wide. Leicester made their first change, which also involved a player called Gray who replaced Okazaki. There was a lovely move as Deeney combined with (our) Gray, but the shot was saved by Schmeichel. Leicester were shouting for another penalty when Mahrez went down in the box, but the appeals were waved away. 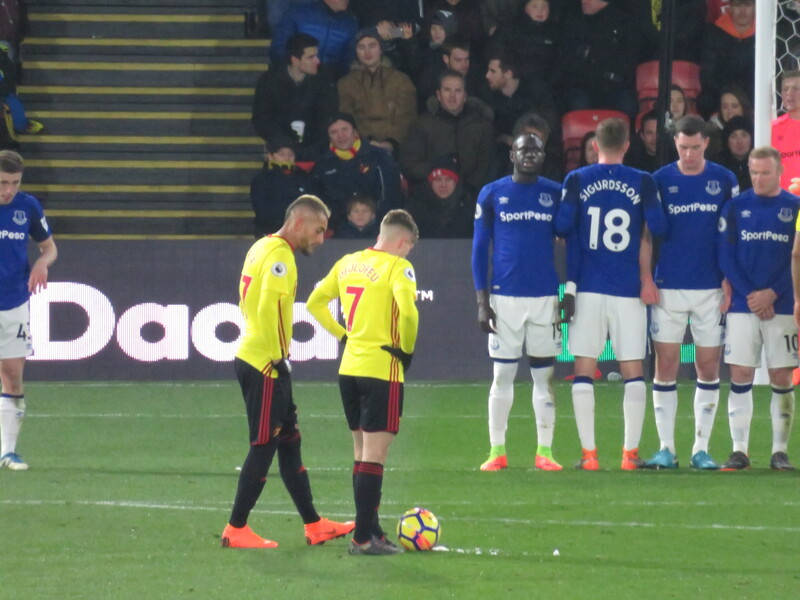 A decent chance for the visitors went begging after Richarlison released Doucouré whose cross seemed to get stuck under Gray’s feet so he was unable to take a shot. The Watford man should have grabbed the equalizer soon after when he received a lovely ball from Deeney, he was one on one with Schmeichel but hesitated long enough for Maguire to get into position to block his shot. So frustrating. The Watford pressure continued as Richarlison broke into the box, his shot appeared to be blocked for a corner, but a goal kick was given. Then a corner from Watson was headed just over by Deeney. Silva’s final change was to bring Okaka on for Janmaat. So, after starting with one up front, Watford now had all three strikers on the pitch at the same time. Ironically, it was at this point that the visitors stopped creating chances. Instead Leicester had a great chance to increase their lead as Mahrez played the ball back to Ndidi whose shot required a decent save from Karnezis to keep it out. But the home side scored their second in time added on as Okaka dwelled on the ball too long before being dispossessed, Mahrez broke and shot across Karnezis into the far corner. The scoreline definitely flattered the home side, as it had been a pretty even game. Many around me spoke of a better performance by the Hornets, but I thought they were being rather charitable. It certainly wasn’t as poor as the first half against Southampton, but Leicester did not play particularly well and still beat us fairly easily. You could argue that it would have been a different game if Deeney’s goal had stood or Gray had scored the sitter, but Leicester had used their pace to their advantage and Watford had no reply. It was a disgruntled group who reconvened for post-match drinks. We harked back to how impressed we had been at the start of the season when the football had been entertaining, the work rate impressive, the players played for each other and we truly believed that we could beat any other team (apart from Man City). That magnificent team had been replaced by a shambles that often looked as though they had only met on the bus to the ground that lunchtime. The downturn had started when Everton made the approach for Silva. I was willing to give him the benefit of the doubt for some time, particularly in view of the injuries, but the team which was comfortably mid-table when the first approach was made had finished the day in 10th place but only 5 points off the relegation zone. With no prospect of any improvement, I think all of us had lost patience with Marco Silva. On Sunday morning it became apparent that Gino Pozzo had also had enough and by the end of the day Silva had been replaced by Javi Gracia. As with the majority of the Pozzo appointments, I know nothing about the new man. I just hope that he can get the team back to their early season form. We have games against Southampton (in the cup) and Stoke coming up and need to see considerable improvement from these players if we are not to be dragged into a relegation battle that I would have no confidence that we could win. This entry was posted in Watford FC and tagged Abdoulaye Doucoure, Adrien Silva, Aleksandar Dragovic, Andre Carrillo, Andre Gray, Ben Chilwell, Ben Watson, Christian Kabasele, Claude Puel, Daniel Amartey, Daryl Janmaat, Demarai Gray, Harry Maguire, Jamie Vardy, Kasper Schmeichel, Leicester City FC, Marc Albrighton, Marco Silva, Marvin Zeegelaar, Matty James, Molla Wague, Orestis Karnezis, Richarlison, Riyad Mahrez, Roberto Pereyra, Sebastian Prodl, Shinji Okazaki, Stefano Okaka, Troy Deeney, Watford FC, Wilfred Ndidi on January 21, 2018 by franelynn. With Friday being the first anniversary of Graham Taylor’s passing, this game took on a greater significance than normal. The Saints being the opposition had an added poignancy for our group of friends as the fixture at St Mary’s had been Toddy’s last away game. That had been a magnificent performance that sent us all home believing that this team could do great things. That belief has been sorely tested over the past few weeks. While wandering around the museum, I bumped into a familiar face in Steve, a season ticket holder who travels from Swansea for every home game. He had left home at 5:30 that morning and, when I left him, was heading straight for the ground. That is dedication for you. To the West Herts and I just wanted to hug all of my friends. After making toasts to absent friends, we were having a lovely chat about theatre and a patchwork exhibition in Prague when the peace was shattered by the arrival of the Norfolk Horns. Having seen photos on Facebook, I knew that they had travelled by train and, from previous experience, it was clear that they would arrive in a rather jolly state. As if to prove a point, Russell appeared with a tray of Sambuca shots. It all became rather raucous and, by the time we left for the ground, I wasn’t sure how many of them would be allowed in. We left in plenty of time to ensure that we were in our seats well before kick-off so that we could join in with the “scarves for GT” display that had been planned by the 1881. I had brought my first scarf with me which, if my memory is not playing tricks, was bought in Peter Percy gentleman’s outfitters in 1979. As this is so precious to me, it was tucked into my bag for safe keeping while I wore my “everyday” scarf. As the build-up to the players’ arrival continued, I noticed that the man who sits next to me had no scarf to raise, so I loaned him one of mine. As Z-cars played, scarves were raised which seemed to cover each stand. It was a magnificent sight that has the hairs standing up on the back of my neck as I write about it. I was rather choked up to see how many Southampton fans also raised theirs. Well done to both sets of fans for a wonderful tribute to GT. Team news was three changes from the cup win last week with Watson, Richarlison and Gray coming in for Capoue, Pereyra and Deeney. So the starting line-up was Gomes; Janmaat, Wagué, Kabasele, Zeegelaar; Doucouré, Watson; Carrillo, Cleverley, Richarlison; Gray. With emotions running high at Vicarage Road as we remembered GT and the tremendous teams that played for him, these guys needed to put in a very good performance or the crowd was likely to turn on them. The visitors had a decent chance to open the scoring in the third minute when Long had a shot from close range, Gomes made a good save, but the referee blew the whistle for an offside that had not been flagged by the lino. There was another chance for the Saints as a defensive header from Zeegelaar fell to Cedric who shot over the bar. Nearly 20 minutes had passed before Watford launched an attack worthy of the name and it was a decent one. Camped in the Southampton box, Gray and Carrillo both managed shots that were blocked before, finally, the ball reached Janmaat whose shot from distance was tipped over by keeper. Needless to say, as soon as Watford missed a decent chance, the opposition took the lead. A cross from Long found Ward-Prowse in space and he finished with a shot across Gomes into the opposite corner. The visitors continued to threaten as Zeegelaar failed to cut the ball out, allowing Tadic to cross for Long whose header had to be pushed to safety by Gomes. At this point, there was the unusual sight of a bloke being escorted out of the SEJ stand. I can only assume that annoyance at the performance had pushed him over the edge. Southampton threatened again as Hoedt spotted Gomes off his line, so tried a lob from distance which looked as though it might sneak in until the Watford keeper rose to tip it over the bar. A rare bit of quality passing by the Hornets allowed Cleverley to break, but he was stopped by a trip from Højbjerg, who was booked for the offence. Cleverley took the free kick launching the ball into the box where it was easily gathered by Southampton keeper, McCarthy. There was another decent chance for the visitors as Long hit a shot from close range and Zeegelaar just got a foot in the way to divert it away from the goal. With ten minutes remaining in the half, Silva opted to make a substitution. The board went up indicating that Watson was to be replaced by Pereyra, but Cleverley spoke with Silva and walked off instead. There were loud boos from the Rookery, but Cleverley had been clutching his hamstring, so this was not Silva’s decision. There was despair on faces around me. We cannot afford to lose Cleverley for any length of time. A rare chance for the Hornets came as a free kick from Watson was met by the head of Kabasele, but his effort nestled on the roof of the net. Gray tried his luck with a turn and shot that was blocked. Then another cross from Janmaat looked as though it would reach Richarlison in a dangerous position, but the keeper was first to the ball. Southampton’s second goal was almost a carbon copy of the first, this time it was Wagué who lost his player, Long crossed for Tadic who laid the ball off to Ward-Prowse to score his second goal of the afternoon. There was a shout from behind me, “GT would be giving you all a bollocking.” I think he spoke for everyone in the Rookery and the half-time whistle was greeted with angry boos. The conversations at the break all had the same theme. There was no passion being shown by the Watford players, they didn’t look like they wanted to be there. I have to say, I have never heard so many complaints in the queue at the Ladies. Kate was making a rare visit from Saudi Arabia and bemoaned the fact that she had made a huge effort to get there, but the players were doing nothing of the sort. The consensus was that the first half performance had been an absolute disgrace. Silva made a significant change at half time, bringing Deeney on for Watson and there was an immediate change in the approach to the game with the players demonstrating an increased level of energy and commitment. The Hornets created a chance in the first minute of the half following a cross from Janmaat, unfortunately both Gray and Richarlison went for the ball and the header flew over the target. Gray then fought his way into the box, but was muscled off the ball by Hoedt, illegally in the view of the Watford faithful and you got the feeling that if he had gone down he’d have won a penalty. On this occasion the boos were directed at the referee. Watford were getting closer to reducing the deficit as Carrillo laid the ball off to Pereyra who curled a shot just wide of the target. Then Deeney played the ball back to Richarlison whose shot was blocked. The goal had been coming and it was Gray who made the breakthrough nodding home from close range after Janmaat’s shot had rebounded off the bar. The fans celebrated wildly, the players just ran back to the centre circle. There was still work to do. The Hornets continued the pressure as a cross from Doucouré was blocked and fell to Carrillo who shot well wide. 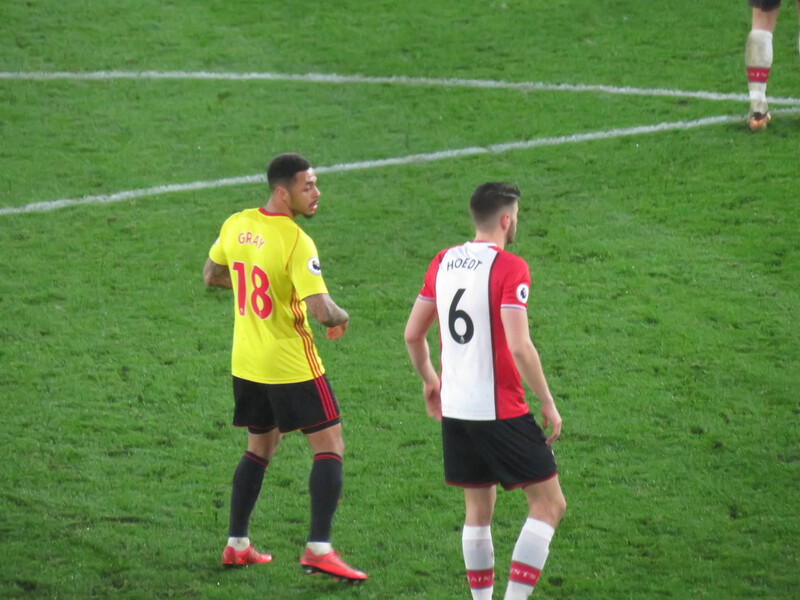 The first substitution for the visitors saw Davis replaced by Lemina. But still the Watford dominance continued. Gray broke down the left and put in a dangerous cross that was turned wide. From Pereyra’s corner, Wagué rose and headed wide of the target. The visitors had a rare second half chance as Højbjerg headed just over the bar. At the other end, a cross from Janmaat was met by the head of Gray but he was stretching and the effort was well wide of the target. Silva made a final substitution replacing Gray with Okaka. I am not sure I agreed with that one, but it would give the visitors something else to think about. The 72nd minute was greeted with a rousing chorus of “One Graham Taylor”, this time with scarves held aloft. It was very moving. Watford pushed for the equaliser as a Zeegelaar cross was headed back by Deeney to Okaka whose shot was gathered by McCarthy. Southampton had been doing their best to run the clock down all half and, finally, both McCarthy and Tadic were booked for time wasting. There was a brief break in the game as Okaka needed treatment after challenging the keeper for a header in the box and receiving a punch to the face. As we reached the last minute of normal time, Pereyra chipped the ball into the box, it was headed on by Deeney to Doucouré, who bundled it home. I thought at the time that the ball hit his hand, although it didn’t appear to be deliberate (television pictures may tell a different story). I looked nervously at the lino, but there was no flag, the goal stood and the Hornets won a point that was just reward for a tremendous second half performance. The players left the pitch at the end of the game to warm applause. In a game of two halves like that, it is always preferable that the good half comes at the end. It was hard to believe that those performances had come from the same team, but the introduction of Deeney had been the difference. Apart from his energy and leadership, it made a difference to Gray to have another forward player alongside him. Silva persists in playing one up front, but none of our strikers suit that role. I can only hope that the improvement that was apparent when we played two up front gives him pause for thought. But this was not a day when the result was the most important thing. The tribute to GT by the fans showed how much he meant to us and it is his legacy that we celebrate. My day was spent surrounded by friends and family brought together by a shared passion. It was a day filled with laughter and tears as we appreciated the friends around us and paid tribute to the absent friends with whom we shared so many happy memories. 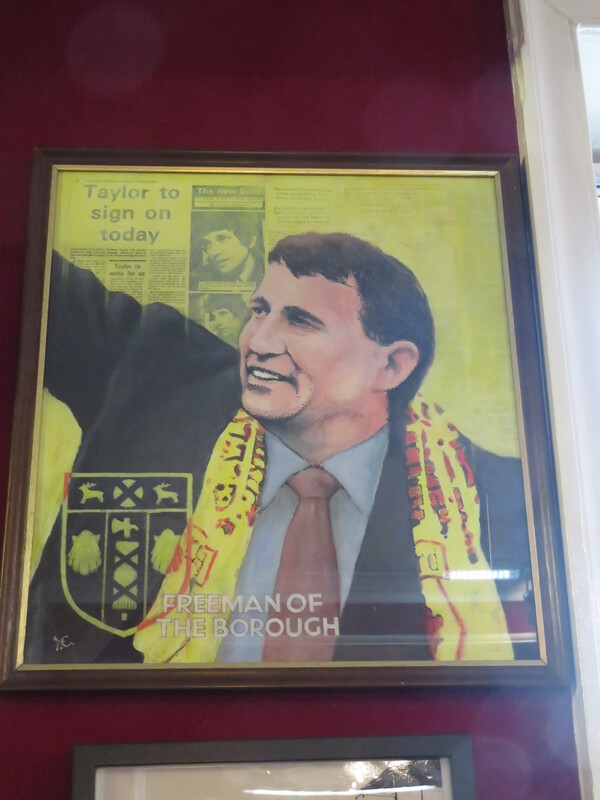 Graham Taylor and the club that he created in his image have given me so many wonderfully happy times over nearly 40 years, and for that I will be eternally grateful. 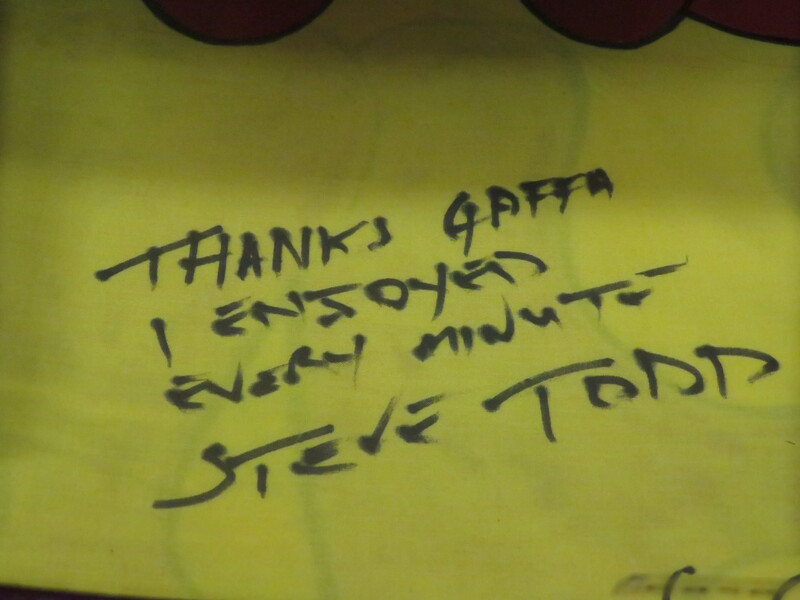 Thank you, GT. This entry was posted in Watford FC and tagged Abdoulaye Doucoure, Alex McCarthy, Andre Carrillo, Andre Gray, Ben Watson, Cedric Soares, Christian Kabasele, Daryl Janmaat, Dusan Tadic, Heurelho Gomes, Jack Stephens, James Ward-Prowse, Josh Sims, Marco Silva, Mario Lemina, Marvin Zeegelaar, Mauricio Pellegrino, Molla Wague, Oriol Romeu, Pierre-Emil Hojbjerg, Richarlison, Roberto Pereyra, Ryan Bertrand, Shane Long, Southampton FC, Stefano Okaka, Steven Davis, Tom Cleverley, Troy Deeney, Watford FC, Wesley Hoedt on January 14, 2018 by franelynn.